I have been using the 1DFR rod series exclusively since they were released into the Austrian market in January 2019. Basically, these are awesome light weight rods specifically designed for fishing with lures and soft plastics. Ideal in salt water and estuary systems. They look great and they handle exceptionally well. 1DFR stands for One Directional Fibre Reinforcement. This is a type of technology that allows the rod to be strong whilst thin and sensitive. A unique manufacturing process binding the outer fibres allowing the tip to be stronger and thinner. Its been reported up to 4 times stronger then a standard blank. Despite the technology advancements these rods simply look great with a stylish white polish, Eva handles. They also come with One Sin Salt guides which means less friction, longer casts and less wear and tear over time. With perfectly balanced blanks the 1DFR range ensures greater rod and tip power and longer casting distances. The 1DFR salt range is quite comprehensive. They come in many sizes and weights that cover most lure fishing requirements in Australia. These areas have been categorised as inshore, offshore and shorespin. The inshore spin series for lighter fishing targeting species such as pinkies, whiting, flathead. The offshore spin series for targeting bigger species of fish such as Snapper and Gummy sharks. 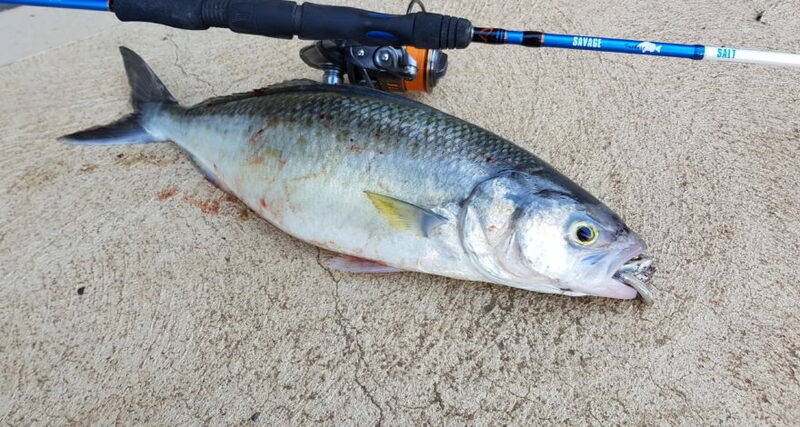 And shorespin spin series providing long casting distance for species such as Salmon, Mulloway, Tailor and squid. There is also the 1DFR browser bait casters which are an ideal choice for targeting Barramundi, Cod, and yellow belly. To date I have been fishing with the ultra light 1-4 kilo version and the slightly stiffer 3-5 kilo version. I have really enjoyed my time fishing with them. I have really taken to the 3-5 kilo model which feels lighter, it feels a lot more like my 2-4 kilo rods yet has that increased power to battle bigger fish. I have paired my 3-5 kilo rod with a Stealth 2000 reel and spooled the reel with 9.3 adrenaline braid. I have had some amazing sessions on big schools of salmon and juvenile snapper. The rod bend is amazing it really allows you to enjoy the battle with a fish that’s only 40 to 60 cm. I have also used the 1-4 kilo ultra light version to target estuary species such as bream, estuary perch, flathead.